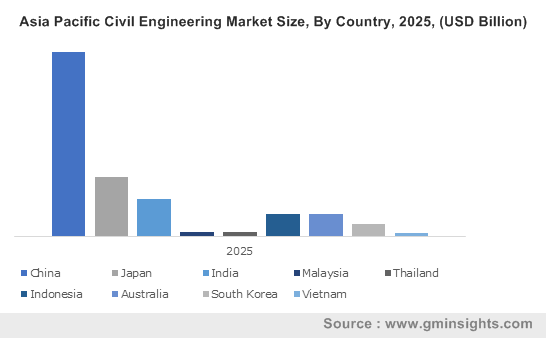 Civil Engineering Market size was valued at over USD 9 trillion in 2018 and will exhibit growth at over 4% from 2019 to 2025. Surging demand for environment-friendly buildings in conjunction with supporting government initiatives and increasing urban population across major metropolitan cities on a global scale are providing a positive outlook for the civil engineering market size. Rising R&D investments by major industry players in several technologies including smart grids, urban mobility, industrial automation, and parking systems offer innovative systems and alternatives to customers. Shifting consumer inclination towards zero-energy and insulated buildings integrated with double skin facade and PV panels will escalate the market share over the study timeframe. Higher potential opportunities for infrastructure planners, operators, and owners are providing numerous prospects for infrastructural development. Rapid urbanization coupled with surging economic growth among the emerging nations including South Africa, South Korea, and the UAE will propel the industrial infrastructural development. Increasing utilization of designing software such as AutoCAD and Revit for producing accurate engineering drawings are offering cost effective approach for civil engineering designs. Proficient deployment of IT services in the form of digitization of construction permits along with flexible regulations for complex building standards contributes significantly towards lowering the approval processes and time for initiating a construction process. For instance, in the U.S., the advanced mobile inspection technology and e-permit systems have reduced the approval time by over 30% and the number of on-site inspections by 25%. Rising deployment of combined 3D modeling and Building Information Modelling (BIM) concepts in construction of electricity networks, superstructures, and bridges will further boost the civil engineering market over the projected timeframe. Incorporation of favorable policies, and norms by several government bodies across the globe will significantly impact the market growth. Shifting preference for enhanced safety and effective mitigation of adverse effects on productivity will further promote the industry share over the projected timeframe. Moreover, harmonization of building codes & standards at a national level will further reduce complexity associated with construction activities. For instance, the Eurocode initiative harmonized the methodologies to calculate and design of construction projects in Europe. Stringent regulations related to the safety and prevention of potential risks & hazards are contributing towards increasing the overall costs to the infrastructure firms. The higher time consuming and stringent procedures in tender procurement including delays in administrative approvals and payments to contractors may restrict the civil engineering market size over the study timeframe. The increased overall cost of projects owing to delays in these activities along with improper estimations may hinder the market growth. The government purchase segment accounted for over 50% share in 2018. Improved political environment coupled with enhanced regulations & norms for construction activities will augment the market size. Large-scale investments for improvement of various public infrastructures in conjunction with majority of the asset & capital possession by government bodies supports the segment growth. Multiple building projects across several rural areas governed by official bodies targeting growth and development across the region are further promoting the civil engineering market share. Growing finance and service provisions by private institutions for multiple construction projects are strengthening the private business segment over the forecast period. Significant efficiency gains emerging from marketing & management skills provided by private businesses have immensely influenced the overall construction, maintenance, and operational costs across the civil engineering industry. Moreover, availability of financial support for development of infrastructural projects, eliminating the requirement of public expenditure will further stimulate the market growth over the projected timeline. Residential buildings will witness significant growth over the forecast period owing to rapid urbanization and population surge in the emerging economies such as India, South Africa, and Saudi Arabia. The incorporation of new & innovative building technologies in construction & infrastructure along with the increasing utilization of green raw materials will augment the segment growth. In addition, enhanced capacity, affordable pricing, and higher efficiency of the new building materials are among the key factors driving the business growth. The growing consumer disposable income coupled with low interest rates will positively influence the market share over the study timeframe. Civil engineering demand from transport is projected to witness 3.5% CAGR up to 2025. 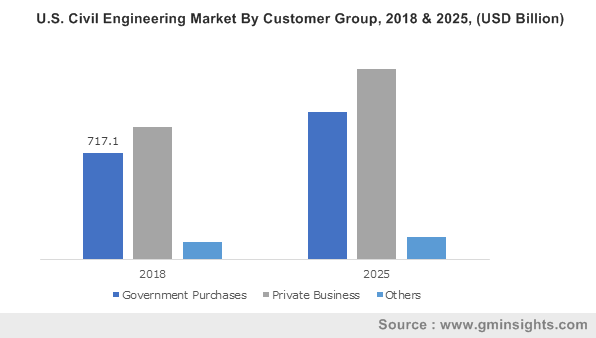 Shifting inclination towards planning, maintaining, and constructing key infrastructure to enable international & national travel opportunities across the globe are propelling the civil engineering market share. An upsurge in the implementation of smart railways in miscellaneous railway services providing improved rail operational performance, reduced operating costs, and standardized rail infrastructure will further promote the market size over the projected timeframe. 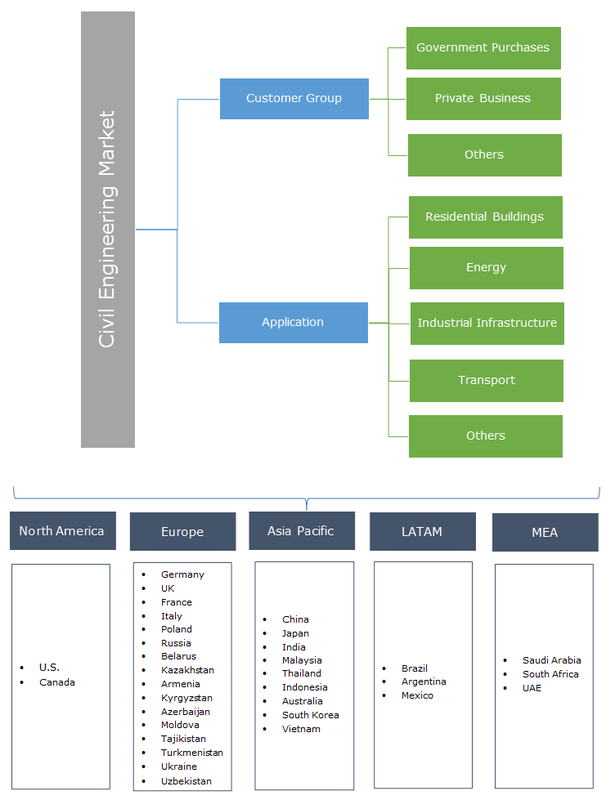 North America civil engineering market will showcase a significant growth at 5.0% from 2019 to 2025. Increasing investments in infrastructure & construction projects by major market players and growth in the U.S. economy are among the prominent factors supporting the business expansion. Additionally, continuous development of sewage networks across major metropolitan cities in North America will further propel the industry landscape. For instance, as per the American Water Works Association report of 2017, over USD 1 trillion will be required to expand & maintain service for meeting the consumer demands over the next 25 years. Europe civil engineering market place will witness substantial growth over the study timeframe. Rapid technological advancements & innovations in construction techniques along with significant digitalization trends will promote the market share across the region. Rising demand for faster, smarter, and affordable building processes in major economies including Germany, France, UK, and Italy will escalate the regional growth. Moreover, shifting preference towards advanced building concept designs in conjunction with supportive government regulations will provide a positive outlook for the market expansion. 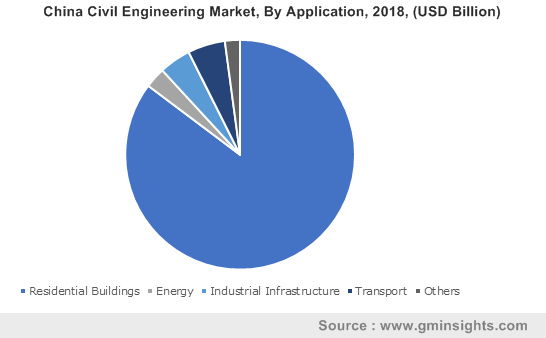 The major market players in the civil engineering market are AECOM, Vinci Construction, Royal BAM Group NV, Hyundai Engineering & Construction Co., Ltd, and Technip. The other notable participants include Jacobs, ACS Actividades de Construcción y Servicios, Fluor Corporation, Skanska, Bouygues Construction SA, and Balfour Beatty PLC. Industry participants are hiring specific industry specialists and making significant investments in innovations & technological advancements to gain a competitive edge over other market players. They are engaged in strategic collaborations and joint ventures to strengthen their foothold in the civil engineering market place. For instance, in February 2019, AECOM announced the establishment of a joint venture with Canyon Partners LLC. This strategy enabled both the companies to develop large-scale, institutional & commercial real estate projects. Civil engineering mainly involves the construction, design, and maintenance of several projects such as bridges, buildings, and roads. Additionally, it is a science that includes multiple disciplines, such as geology, structures, and soils, thereby the entire market is majorly connected to the historical background of advancements in these sciences. The stringent safety norms and development of a rating system to improve the environmental performance of buildings will generate the requirements for integrating new technologies in infrastructures. For instance, The U.S. Green Building Council (USGBC) is engaged in the development of the Energy and Environmental Design (LEED) rating system.